Hello 2016! I am ready for the best year of my life! I know this post is a week late in coming. It literally took me through the fifth of the month just to fully wrap my brain around my intentions for the year. But I'm ready now, and easing into turning those intentions into realities. Fair warning - this post is long. 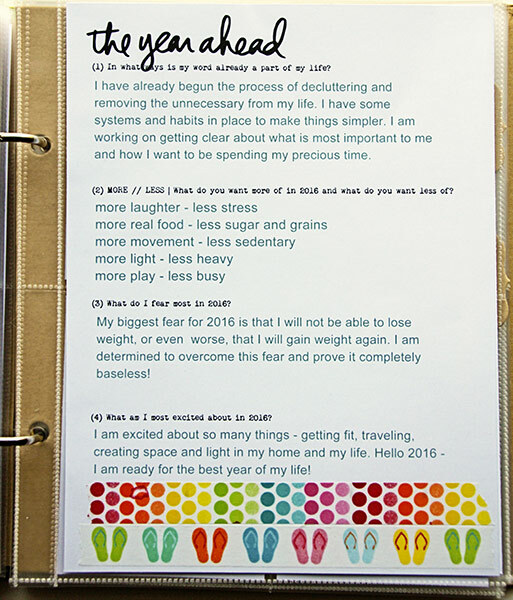 My primary intention for 2016 is to take my health in hand - get fit, lose weight, and break my sugar addiction. I joined Cathy Zielski's FIT class and was thrilled to have Melissa, Alexa, Karen, and Alison also join in the class. It's not too late if you are interested - introductory pricing of $26 for the whole year is good through January 15! I'm excited about this class and my blog friends joining in for the factor of accountability. I need to be accountable outside of myself or I just don't get things done. My FIT title page. I tweaked Cathy's colors just a bit. My first page of the many cards Cathy provides for tracking. I'm not going to use all of the cards she provides - just the ones that fit my needs for each month. I'm absolutely cringing at putting the numbers out there, but I'm trying to be honest and real with myself and accept that this is where I am at right now. It's the heaviest I've been in my entire adult life and I do not like it - not one little bit! I'm hoping that putting these mortifying numbers out there will give me the needed motivation (or kick in the pants if you will) to actually make some changes in my life! The little red dress in the photos is very similar to the one I bought (mine is a little longer) and haven't yet worn. I bought it when I was at least 14 lbs lighter than I am now and at the time, I really needed to lose another 5 pounds to make it look good. I will never have the leggy look of the model wearing this dress, but this photo gives me a tangible goal to strive for that isn't tied to the number on the scale. The daily step goal of 5000 steps will be adjusted as I start to consistently reach my goal. Right now, left to my normal sedentary work day, I only get in about 3500 steps. So yes, even a mere 5000 is pushing me out of my comfort zone - just not too far. I'm hoping to rack up some success before I up the goal! 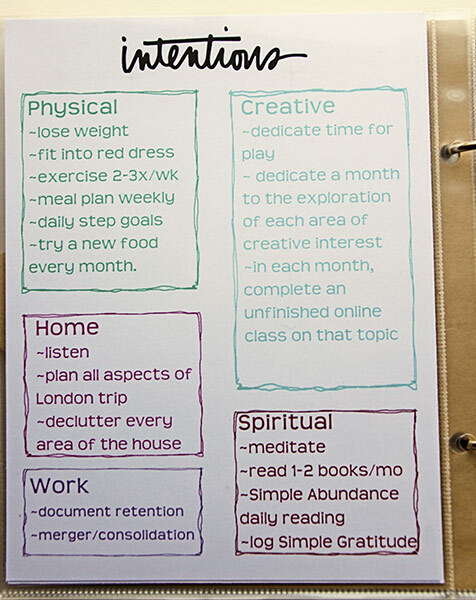 I was inspired by the one page tracker Melissa is using to track her quiet time. But I needed something that would fit my 6x8 album and I didn't want to pay for a download I would have to change anyway. So I created this one in PSE. 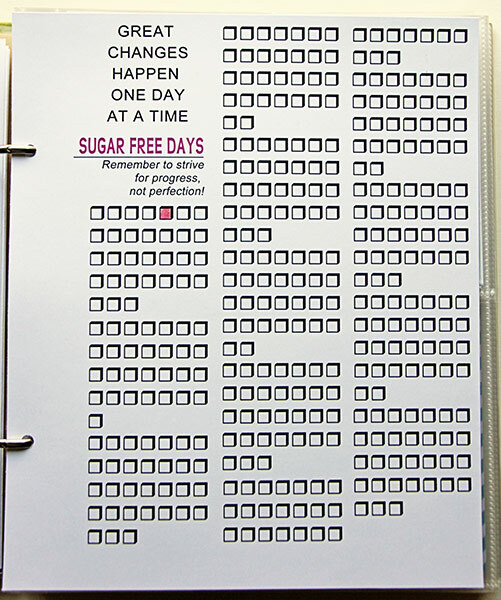 I'll be tracking every day that I eat sugar free! I hope to see a LOT of colored squares by the end of the year! If anyone would like this tracker, say the word and I'll email you a printable file. I can leave the subject line blank or fill it in with your choice of topic. 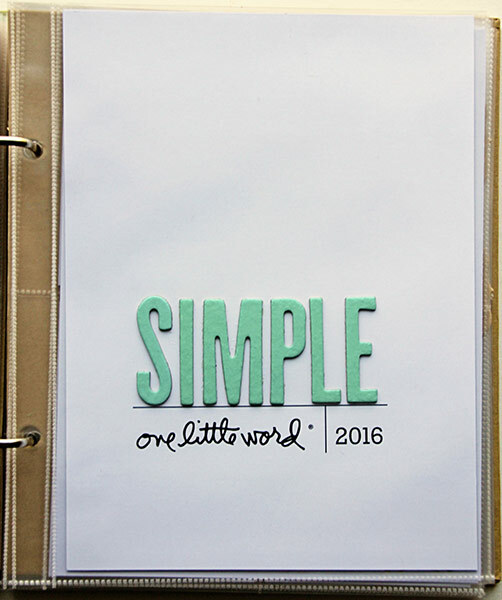 I'm also participating in Ali Edward's One Little Word class again this year. My word for 2016 is SIMPLE. In an attempt to honor my word, I've kept the title page simple. In fact, all that white space kind of bothers me. But I'm trying it on for a bit to see how it feels! this should read "unnecessary clutter and busyness" - but I haven't gone back and corrected my spelling mistakes on the card yet. Not sure if I will. and anything else I happen to think of during the year. I may give some topics two months and really delve in. I'm hoping this approach will be easier than trying to hit everything each month. Have you chosen a word for 2016? How does it tie in to your intentions for the year? Great to read of your enthusiasm and commitment, and we will al be supporting each other and cheering each other on :). Your word fits in very nicely ... I am interested by your mention of grain free - I have been eating grain free for over a year and feel really well. I wouldn't go back to it. I'm so excited that there are several of us in the FIT class together!! 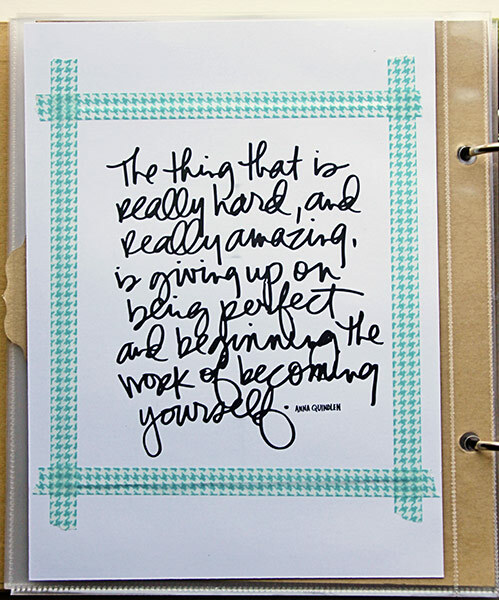 I'm simply creating one page that I'll put in my binder. I have the front of the page done and just need to add journaling to the back; then I'll do a blog post about the class, too. Thanks for sharing your numbers - I was debating about it but feel the same way you do. I really like the Simple title page! I can't do anything about album pages for FIT or One Little Word until we get home a week from now. 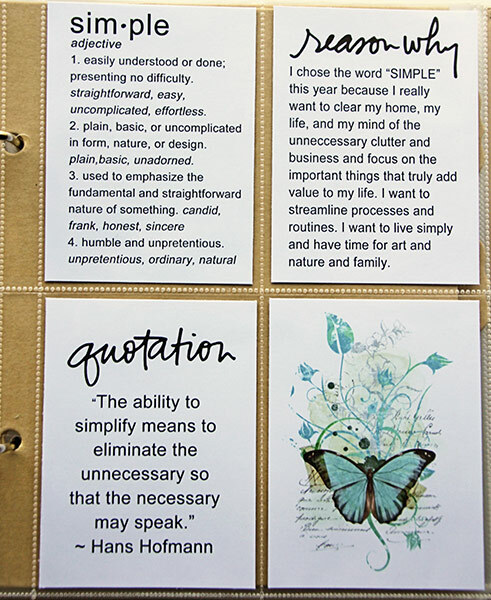 I'm loving your pages for OLW (that butterfly card is gorgeous.) It's nearly impossible to get many steps in when you're driving over 500 miles a day! (Although we did get out of the car and walk around for awhile in Frederick, Maryland this afternoon.) Once we get to the beach, though, the number of steps will go way up (better than I'll be able to do when I get home most days.) I'll be glad to get home and get into a routine, though! I'm looking forward to this being a great year, too. Everything looks very organised - you're ready to go. I wish you every success and good luck on this yearlong journey. You can do it! I don't have a word for 2016 - I've stopped to choose a word a couple years ago. My intentions always seem to be the same - kindness, healthy, creative. This can be filled in so many ways. Healthy, though, is the most important for me this year. I did find the month long focus very helpful. I hope it works for you, too. I"ll be cheering you FIT girls along from the sidelines. One big thing I did last year was to get to the doctor and get up to date on all my tests (mammogram, pap, etc.). That was a big relief! I"m still working on my intentions post, and I really like reading everyone else's. And still working on my 2015 round up as well. I'll be cheering you on! You can do this! Having reached a weight that is more than the day after I had Gracia, I too have decided it is time to take things in hand! I have started on Lean in 15 and the recipes are low carb and the only sweetner is honey - found it a struggle the first few days. I am sure you will achieve your goals this year and look fabulous in that little red dress. 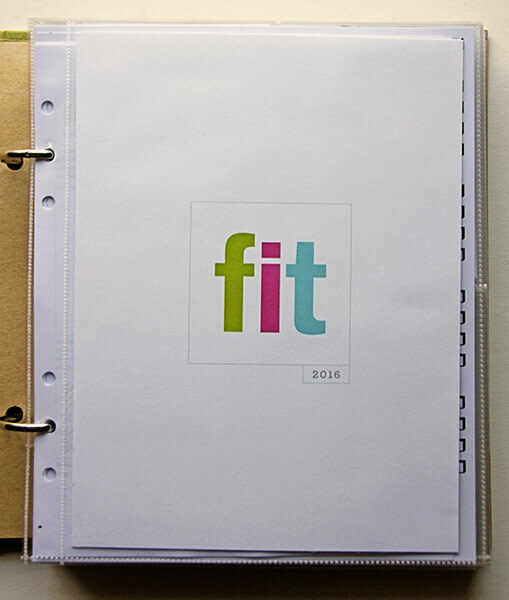 I love your FIT page and your OLW pages too. And the picture of the dress is a great idea! I am just getting to printing some pages today. Are you enjoying Simple Abundance? I notice that you're coming to London.....I really do hope that we can meet up!! Good luck with all your great intentions...I'm definately in need of losing some weight. Your pages for both programs are lovely. You go girl, you can do it. 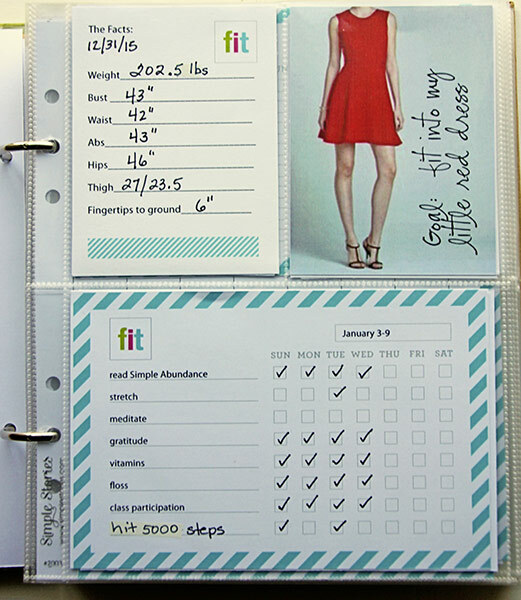 Cool set of pages - I like the red dress. I'd love a copy of that tracker please!